Roy Moore is broke & begging for cash. He blames LGBT people. In a rambling post, Moore says that he needs $100,000 for legal fees. 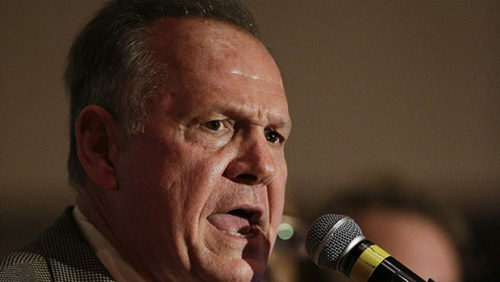 Moore has been sued for defamation by Leigh Corfman, who accused him of locking her in a car and sexually assaulting her when she was 14 and he was 32. Moore responded to her accusations by calling them “politically motivated,” “completely false” and “malicious.” He discredited her by saying she had “disciplinary and behavioral problems” as a teenager. Corfman’s suit is seeking compensation for legal costs, an apology, and a ban on Moore publicly attacking her. She is not seeking monetary damages. But Moore only briefly mentions the lawsuit in his Facebook plea. He wrote more about all the people who are out to get him, from the “Washington Establishment” to George Soros, a Jewish, Democratic donor who is a frequent character in rightwing conspiracy theories. “The liberal media, in association with some who want to destroy our Country do not want my influence in the 2018 elections and are doing everything they can to stop me,” he wrote, implying that “gays, lesbians, and transgenders” are behind Corfman’s lawsuit in an effort to keep him from campaigning later this year. His fundraising page appears to be offline at the moment. The Washington Post reported last night at 5 p.m. that Moore had raised $32,000 of the campaign’s stated goal of $250,000. Moore’s money-ask is pretty fishy, even if one ignores his tirade against everything and everyone. First, why does his campaign have a goal of $250,000 when he estimates legal costs at $100,000? Second, if all Corfman wants is an apology for attacking her… why doesn’t he just apologize for attacking her? She doesn’t appear to be asking him to even admit that he assaulted her in 1979. Last, why doesn’t a 71-year-old with a long career as a judge and a lawyer have money for legal fees? How is he broke? It’s unseemly for a prominent figure in the party of “personal responsibility” to beg constituents for money for something that he could probably afford himself, just because he doesn’t want to apologize for his public conduct.